Palavrador is a work of collective authorship that offers us an image of ourselves as a mixture, or at least strange balance, of "eros" and "chaos." Transferred into a 3D world as a kind of flying animal, the user starts a journey during which she navigates poems that are themselves made dynamic by AI algorithms. The reading process here is rendered as intuitive navigation, the user crashing against the "flocks" of words that themselves wander through the video game environment. Author description: Palavrador is a poetic cyberworld built in 3D (Palavrador comes from the Portuguese word palavra, which itself means "word"). Directed by Francisco Carlos de Carvalho Marinho (Chico Marinho), it was nonetheless conceived and implemented as a result of synergetic collective assemblage of ideas and activities of a wider group of authors with backgrounds in the arts, literature, and computer science. Six flocks of meandering poems autonomously wander through the three-dimensional space. The readers may choose how many flocks of poems they want to see wandering through the environment, and the poems (botpoems) are able to turn around obstacles to keep their unveiling cohesion while moving through the space. The logic of movements was implemented using artificial intelligence procedures based on swarm behavior and steering behaviors of autonomous locomotion agents. Among the virtual objects of the Palavrador there is a labyrinth whose architecture is generated by mathematical procedures (fractal). There are also video poems, the sounds from which are modulated in relation to the distance of the readers, thus creating an immersive journey with a musical dimension. Readers choose between two avatars to represent them inside the virtual environment, one of which flies, and the other which meanders through the space. 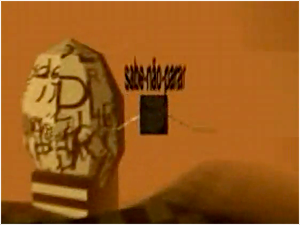 Additionally, it is possible to make the avatars "throw up" flying poems by using the joystick. Palavrador implies action; the creative achievement of words in symbiosis with humans and the autonomous poems (bots) adding new perspectives to art and literature by incorporating ideas from others disciplines such as computer science and biology. Instructions: Click Begin to load video. Previous publication: Palavrador was the winner of the "Ciutat de Vinaròs Digital Literature Award" in 2006.